Wedding photography should be fun for everyone involved, and shouldn't feel like you're being posed and directed all the time. Colorado wedding photographer Mark Creery Photography takes that philosophy to heart, so much so that it is part of his 3 brand words: beautiful, natural, fun (with fun being the most important part on the wedding day). This image typifies the kind emotion that shows on the faces of my brides and grooms. Being on a carousel is already fun to begin with, but instead of making it fully posed, I interacted with the couple to get them joking around and then caught this moment with the bride leaning over to give her hubby a kiss. I was positioned close with an ultra-wide lens to capture the interesting lines of the carousel but still making the couple the focus. 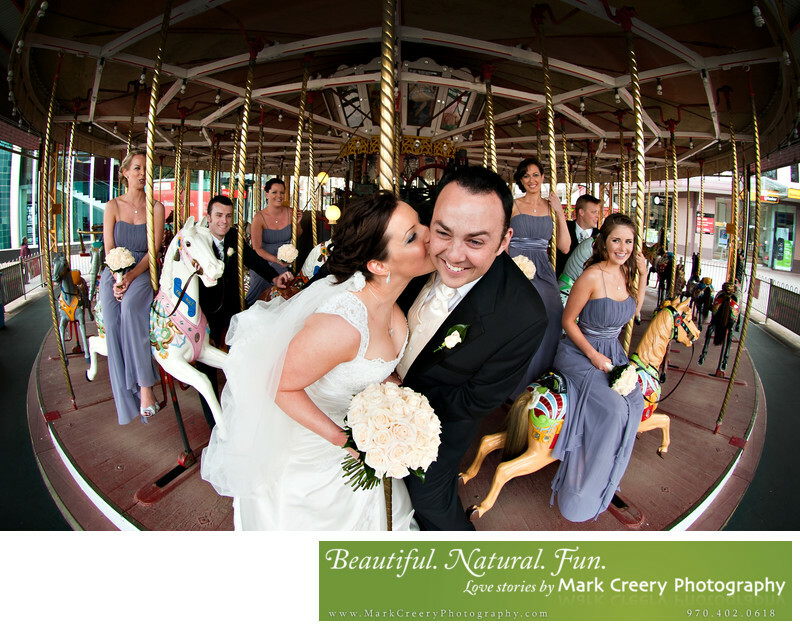 We then continued with the fun by having the carousel go on and have the bridal party whizzing by as the couple stayed in front, for a cool blurring effect behind them. I'm always looking for creative ways to enhance the experience and final images that each couple receives,.